On the floor of Gale crater, NASA’s newest rover is finding that ancient Mars seems to have had an environment quite conducive to microbial life. The researchers coordinating NASA’s $2.5 billion Mars Science Laboratory have always been careful to note that their beefy Curiosity rover is not searching for life on the Red Planet. Rather, it’s designed to find out whether Mars was ever suitable for life. After a year of zapping, scratching, sniffing, and tasting rocks and sand near the rover’s landing site, the answer is “yes.” A flurry of findings published in the December 9th issue of Science, simultaneously announced at December’s meeting of the American Geophysical Society, provide the best evidence yet that ancient Mars was indeed habitable. Curiosity’s Mast Camera recorded this view of sedimentary deposits inside Gale crater in February 2013. The mudstone ledge at lower right is about 20 cm (8 inches) high. Click here for a larger view. 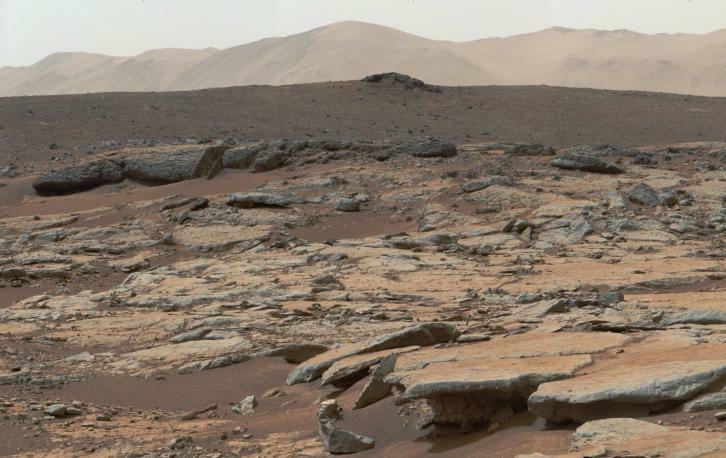 Curiosity dropped onto the broad floor of Gale crater on August 6, 2012, then spent many months exploring intriguing rocky outcrops in a nearby expanse dubbed Yellowknife Bay. Mission scientists soon realized that much of the terrain was covered in mudstone, silty sediments that settled onto the bottom of an ancient lake. What’s now clear, as reported by one research team led by project scientist John Grotzinger (Caltech) and a second by David Vaniman (Planetary Science Institute), is that the sediments contain an iron- and sulfur-rich clay called smectite. Moreover, this clay formed in water with a neutral pH and low salinity — just the kind of benign habitat that primitive life forms called chemolithoautotrophs would want. Such microbes derive their energy from the oxidation of inorganic compounds and their carbon from atmospheric carbon dioxide. A separate analysis by Kenneth Farley (Caltech) and others used isotopic ratios — never measured before by a Martian lander — to estimate the age of a mudstone slab nicknamed Cumberland. It’s between 3.86 and 4.56 million years old, confirming that Gale crater formed very early in Martian history. But Farley and his team also tested for elemental isotopes produced by the potent cosmic rays that constantly bombard the Martian surface. Cumberland’s “exposure age” is comparatively young, only 60 to 100 million years. Apparently the sediments in Yellowknife Bay spent eons buried under the protective cover of overlying material, which eventually was stripped away by the planet’s incessant winds only in the recent geologic past. Biologically speaking, this is great news. It means the rover has at least a chance to detect organic matter that might have become trapped in these ancient sediments. In fact, a research team led by Douglas Ming (NASA Johnson Space Center) reports that Curiosity continues to detect chlorinated hydrocarbons in samples of the Martian surface – and that it can’t all be contaminants brought from Earth. Instead, these simple organics might be indigenous to Mars or else hitchhiked there inside meteorites. In an unusual move for Science, all six of its just-published Curiosity articles are freely available online. You can also watch a press briefingheld during the AGU meeting.